If you think about it, geometry is mankind's greatest enemy. It's the study of shapes and stuff, and, when you really get down to it, everything is made up of shapes and stuff—including the things that kill us. Maybe we should go to war with geometry. We'll chip off the acutest of angles, and exterminate the most threatening fractals. It will be hard, laborious work, but eventually we'll have victory within reach. Until one day... one terrible day, when we realise the truth. WE were geometry all along. It'll be a Euclidean nightmare, and no mistake. Probably best to keep our geometric rage focused into videogames—and the upcoming Geometry Wars 3 could be the perfect outlet. It's got a trailer. I probably should have mentioned that in the first paragraph. It looks pretty sharp, but I do have some concerns. The biggest: Bizarre Creations is sadly no more. This sequel is being handled by Sierra—the resurrected studio now tasked with handling Activision's indie concerns. 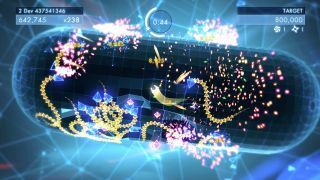 There's always a danger in these cases that the new studio won't be able to capture the same magic—and Geometry Wars is a game that needs the magic. As for the new 3D level layouts, it'll be interesting to see how they play. Either way, the game retains a 2D "Classic" mode. Geometry Wars 3: Dimensions is out, on Steam, on 25 November.